Taiping – a town filled with many historical and cultural wonders. Many tourists today embark on ‘food hunts’, making use of the city’s vast number of hidden restaurants and eateries. Formerly a tin mining town, Taiping is home to many ‘firsts’, including the first museum and the first post office in Malaysia. Owing to its location under the foothills of Bukit Larut, Taiping is also known as Malaysia’s ‘wettest’ town and is home to beautiful rainforests as well as the its famed Lake Gardens. With so many beautiful aspects of Taiping just waiting to be explored, here are 50 reasons for you to visit Taiping. Muzium Perak, otherwise known as the Perak Museum, was the first museum established in Malaysia in 1883. Located at the intersection of Jalan Muzium and Jalan Taming Sari, it sits directly opposite the Taiping Prison. The 8474 exhibits displayed show Malaysia’s history, zoology, and geology, amongst many other parts of old history that have long been forgotten. Some of the exhibits show the culture and products of the indigenous tribes of Perak, including the Senoi and Negrito tribes. There are a total of ten lakes and ponds in the gardens, and many species of flora and fauna. Many tourists enjoy driving, jogging, and walking around the gardens as its picturesque beauty often takes many by awe. Visitors can rent a variety of small boats from the Pusat Rekreasi Dayung (boat house), perfect for couples or small groups. The Lake Gardens are also a popular with cyclists as well as groups of martial artists. Taiping Lake Gardens are located in the main town, close to the foothills of Bukit Larut. A local favourite, Ansari Cendol is located next to Bismillah Cendol. Both have been operating for over 70 years, making them the oldest Cendol stalls in Taiping. Many people flock from all parts of Malaysia to savour the cendol here. Ansari Cendol’s speciality is cendol with red bean and pulut beras (glutinous rice), and is priced from a mere RM1-3. Ansari also sells pasembor, an Indian rojak dish, for under RM3. After Taiping was established as a Heritage town, the shuttle buses were gifted to Taiping by the Japanese government. Not only are the shuttle buses convenient for tourists to go sightseeing in, the buses are also environmentally friendly. The buses stop in 39 places including the Taiping Lake Gardens and Taiping Museum. Visitors can board the bus along the Taiping Heritage Trail, the Zoo, Clock Tower, or Museum. The Taiping Zoo is the oldest zoo established in Malaysia. It houses over 180 species of animals, most of them nocturnal. The zoo is also actively involved in breeding and conservation efforts. The Taiping Zoo features day tours as well as its famed Night Safari tour. Because most of the animals are nocturnal, the Zoo comes alive at night and is a popular spot with tourists. The Taiping First Galleria is a private museum established to showcase the multitude of ‘firsts’ in Taiping. The stately building was previously used by the Perak Trigonometrical Survey Office in 1891, and was the Taiping Municipal in 1930, before renovations occurred to create the museum today. Some of the displays include old trishaws, a train carriage, and many other old artefacts displaying the rich history of Taiping. First Galleria is located on Jalan Stesen behind the Post Office. Bukit Larut, otherwise known as Maxwell Hill, was founded in 1884 by William Edward Maxwell. It is situated 1250m above sea level, and is the wettest place in Malaysia. Maxwell Hill has a comfortable and cool climate of 15 degrees celsius in the early morning, and 10 degrees celsius at night. The best places on Maxwell Hill include the Tea Garden House – a former tea plantation office, and the Gunung Hijau Trail. The Gunung Hijau trail is a jungle hiking trail and features the best panoramic view of Taiping. The best way up to Bukit Larut is via the many jeeps that ferry visitors to and from the resort. All other unauthorized vehicles are not allowed. The jeep travels along a scenic route and the ride takes approximately 30 minutes. Do be sure to hang tight as there are a total of 72 bends, which makes for a thrilling ride as well! For those who would rather not take a jeep up, it is also possible to hike up the hill. Hiking will take approximately 3-5 hours, however the routes are significantly more beautiful than taking a jeep. The All Saint’s Church is a beautiful National Heritage Site established in 1886. It is the first English church in Malaysia, as well as one of the only churches which still uses a pipe organ that can be heard during special masses throughout the year. All Saint’s Church also retains its antique, gothic heritage with wooden rafters and structures. The church grounds include a small attached graveyard, containing the old tombs of European settlers. All Saint’s Church accommodates roughly 350 people and is a popular attraction to many people who enjoy historical architecture. Not only does this resort beautiful scenic views of Malaysia’s largest freshwater lake, this resort is also home to many exciting attractions such as a water park, theme park and eco-park. There are special rates for senior citizens as well as students and children. The eco-park is one of their most famous features, as the package includes a trip across the lake to an island in the middle – named Orang Utan Island. This island is a protected area, specifically for rehabilitation and conservation of the orangutans that roam free. Visitors are restricted to a covered, fenced walkway which allows them to view and interact with the orangutans from a safe distance. A popular feature of the island is the orangutan ‘preschool’, where visitors can play with infant orangutans. Bukit Merah Laketown Resort is located approximately a half hour’s drive from Taiping. Alternatively, ferries leave from the resort every 45 minutes. Kedai Kopi Prima is an open air coffee-shop style eatery (kopitiam) that serves both Halal and non-Halal food – offering mainly Chinese and Malay cuisine. Some of its popular dishes are the Hor Fun, Mee Jawa, and the Pak Cham Kai (poached white chicken). Located on the corner of Jalan Kota and Jalan Manecksha, Kedai Kopi Prima opens from 10am to midnight daily, and is most popular during lunchtime. The prices range from RM3 onwards, making it a cheap and popular choice amongst tourists and locals. The Perak prison, otherwise known as the Taiping Gaol, is the first prison established in Malaysia. It is located opposite the Perak Muzium. Unfortunately, it is not open to tourists due to it still functioning as a detention center. Many tourists enjoy walking around the outside of the prison building as the structure was designed with 19th century architectural techniques, as well as its historical significance in Malaysia. Established in 1906, the mangrove forest in this area became a protected site due to its unique and lush landscape. The forest is home to many unique species which depend on the wet climate of the forest. The Matang Mangrove Co-Education Center offers a forest walk – a bridge suspended upon the forest floor, allowing tourists to spot animals such as bats and otters, whilst admiring the fauna. Bird-watching is also a popular activity in the center. If a day in the forest is not enough, tourists can choose to stay overnight in the chalets and camping grounds. Located approximately half an hour away from Taiping, Kuala Sepetang offers tourists sightseeing of their unique mangrove forests in the form of river cruises. Motor-powered boats take small groups of tourists around the mangrove river, where unique species of animals and fauna are abundant. Some of these species include birds, monitor lizards, monkeys, snakes, and even crocodiles. Many tourists opt to take the 8 to 9pm cruises as that hour is optimal for fireflies. If you’re lucky, you may even be able to see the Indo-Pacific Humpback dolphins, often swimming in pods next to the cruise boats. The Commonwealth Cemetery is a popular place for tourists and visitors to pay their respects to the fallen soldiers of World War II. The cemetery is sectioned into three groups as per their religions – Christian, Muslim, and Gurkha. In the Muslim section of the cemetery stands a statue named the Stone of Remembrance to honour the fallen soldiers. Similarly, there stands a Cross of Sacrifice in the Christian and Gurkha sections as well. The Commonwealth Cemetery is located on Jalan Bukit Larut, and is open at all times to visitors. 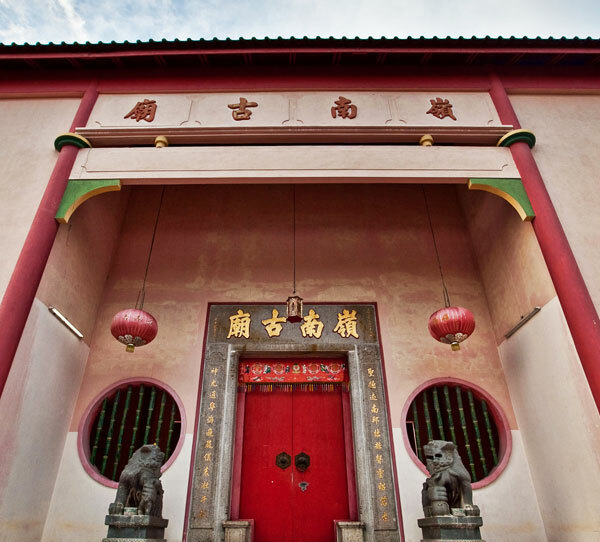 The Ling Nam Temple is the oldest Chinese temple in Perak. Located opposite the Taiping Prison, it remains one of the main centers of worship to this day. It was originally built with wood, however it was reconstructed in 1995 due to the risk of the old structure caving in. Built on a former mining lake, the temple worships the God of Feng Shui, and many Chinese believers and tourists visit the temple to offer prayers and well-wishes. Opened early July 2015, this eco-park was established by bottled water company Spritzer and includes a mini-golf course, a rainforest walk, and the Discovery Tunnel. The rainforest walk, otherwise named the ‘Tree Tag Walkabout’, combines historical learning for children as well as quaint views of the small rainforest within the park. The Discovery Tunnel is a popular attraction to many children and adults alike, as it features a learning center about Spritzer – the no. 1 largest bottled water manufacturer in Malaysia. Located on Jalan Reservoir, tourists will be able to locate it from the giant sign outside the park. This Taiping fountain was donated by a prominent leader of the Taiping Hokkien community – namesake Ng Boo Bee. He was also a member of the Taiping Sanitary Board. When Ng arrived in Malaysia, he was poor and penniless. He traded everything he had, working his way up to become one of the richest men in Taiping during his time. He was famous as he created jobs for other immigrants who lived in Taiping. When he passed away, many people attended his four-hour long funeral procession. Visitors can find the fountain on the Lake Gardens’ lawn. It used to be installed at the Taiping Market, but has subsequently moved. The equine park offers joyrides (most popular to young children) and riding lessons to locals and tourists alike. Apart from horse rides, this park is also known for a Horse Therapy Program. This program is specifically aimed towards special needs children and adults, and features soothing rides as well as bonding sessions with the horses. The park is also available for rent for functions or large events. Taiping Equine Park is also active in the recovery of rescued and adopted horses. The park is located on Jalan Bukit Larut, close to the Taiping Lake Gardens. The tower was originally built in 1881 as a wooden structure, but was reconstructed in 1890 with bricks. The design of it has been kept from the 1800’s, featuring a pointed roof with carefully chiseled archways. The tower was originally used as a police station and a fire station, but today is the location of the Taiping Visitor Information Center. Located in the middle of town on Jalan Kota, the local landmark is easy to find. Inside the Visitor Center, tourists can ask for information and help for getting around the city, or recommended places to see. Inside the office, old photographs of Taiping are displayed for visitors to view. Visitors can also choose to rent bicycles for a cheap price at the center. The famous boy’s school was established in 1883 and now functions as a co-ed school. This school is particularly significant as it is one of the oldest schools established in Malaysia. King Edward VII School was awarded SMART school status, and is now considered as one of the elite schools in Malaysia. Tourists often choose to visit the outside of the school, due to its beautiful old colonial-style architecture. It is also known for its rugby achievements in State competitions locally. Visitors can find it along Jalan Muzium Hulu. Also known as Masjid Melayu Bandar Taiping, the unique hexagonal structure was originally built in 1897 and influenced by Dutch architecture. Not only is it the first mosque in Taiping, it is also the first brick mosque in the town. Many visitors flock to visit the mosque due to its historical and religious purpose. Behind the mosque sits an old cemetery, holding the mausoleum of Muslim scholar Sheikh Makhbuli, as well as other known local historical figures and personalities. Old Kota Mosque is located on the junction of Jalan Kota, and Jalan Masjid. The Indian temple, named Om Sakthi Sri Jada Muneesvara Alayam, is otherwise known for the wild boars that visit from the nearby forest. The boars will arrive during the day when a bell is rung, signaling the arrival of food. Locals often gather for a chance to touch the wild boars, as they believe that a mere touch of their skin will bring good luck for their wealth. Locals often rub ringgit notes or lottery tickets, or opt to stroke the boars for good luck. The boars are very well-mannered, and for safety – there is a barrier constructed between the boars and the crowds which gather at the temple. The temple is located behind Tesco Taiping. Otherwise known as Ho Hsein-ku Miaou, this temple worships He Xiangu, one of the Eight Immortals in Chinese mythology. According to legend, He Xiangu lived in the Tang Dynasty. When she was a teenager, she was told in a dream by a divine figure to eat powdered mica. She continued to eat powdered mica for the rest of her life, eventually ascending to Heaven due to her body’s immortalization by the mica. The temple is located in the same compound as the Cantonese Association – tourists will be able to spot the temple by its red pillars. The compound is located along Jalan Tokong. A family favourite to visit, the Burmese Pool is a large naturally created rock pool at the foothills of Bukit Larut. It is especially popular with the locals – many opt to swim and wade here, as well as hike in the nearby forest. The pool is fed by a small waterfall, and is fairly shallow and safe for non-swimmers as well. The pool is located inside the forest, and visitors can access it via a small trail leading to it from the carpark situated outside. Slightly smaller than the Burmese Pool, the Austin Pool is cleaner and quieter, however non-swimmers should take caution as it is also deeper and the currents are stronger. Visitors can drive to Jalan Lumba Kuda from Taiping town, and turn left at the signboard to Taman Suria. The pool is located on the edge of Taman Suria, and visitors should walk following the jungle edges until a clearing and stream is visible. It is approximately a 7 minute walk from the edge of the jungle to the pool. A beautiful looming building featuring picturesque Victorian architecture, this building is placed upon sprawling grounds which now hold the Larut Matang District Office. Initially named the New Government Office, this building was constructed in 1883 by the British. The offices located inside are the Council Chambers, and offices for the Secretariat, Treasury, Audit, Education, and Forest Departments. Located on Jalan Taming Sari, visitors can look for a large, imposing building of all-white. It is located at the entrance to the Taiping Lake Gardens. La Promise Bakery was originally known by the locals as the Piano Café. This is a popular bakery cafe with the locals. Some of the desserts sold include cheesecake, green tea, fruit tart, and coffees. La Promise Bakery also sells main courses – mostly of the Western variety. Its menu includes mash potatoes, grilled fish, and spaghetti bolognaise. Customers can also choose to order birthday cakes in advance, as the bakery does custom orders. La Promise Bakery is located on Jalan Panggung Wayung, near the Taiping Clock Tower. Located next to the famous SMK Convent girl’s school in Taiping, St Louis Catholic Church is another old church constructed in Taiping. Many masses are held here, and it is particularly famous for its weddings and photoshoots which occur on the grounds of the church. Featuring a gothic design, the church is a particular favourite for visitors to view its beautiful architecture. Visitors can spot it along Jalan Convent. The Larut Matang Food Court is a popular destination for locals and tourists alike. It is an eatery separated into two sections by an alley: Halal and non-Halal. The eatery offers mostly local Chinese, Malay, and Indian cuisine, however the establishment has Western food stalls as well. Some of its popular dishes include Mee Rebus and its famous Char Kuay Teow. Meals here are inexpensive and range from RM3 onwards. Larut Matang Food Court is located near the Taiping Clock Tower. Casaurina Inn is a former hotel back in the early 2000’s, but has now been long abandoned. The place is still of significance as many bridal parties choose to hold their photography sessions outside the Inn due to its 32 white statuesque pillars scattering the edge of the inn grounds. These pillars date back to colonial era villas, and remain standing to this day. Casaurina Inn is located near the Lake Gardens and Taiping Zoo, along Jalan Sultan Mansor. Pusat Makanan Taman Tasik food court consisting of mostly Chinese food stalls. This is an open air eatery frequented mostly by locals. Recommended dishes include Chee Cheong Fun, Char Kuay Teow, and cockles. The Ikan Bakar (grilled fish) from a stall named Sako is also a family favourite. The food offered are relatively cheap, from RM3 onwards. It is located on Jalan Maharaja Lela, or across the road from the Taiping Lake Gardens. From the outside, Bismillah Restoran looks like your run-of-the-mill Mamak-style coffee shop, however this mamak was established in the 1900’s, making it one of the oldest eateries in Taiping. Many locals frequent the place, ordering dishes such as Roti Canai, Nasi Briyani, and Thosai. It is opened 6AM-9PM daily, and is closed during Friday prayers (12-2PM). It is one of the cheapest eats in town, ranging from a low RM2 onwards. One of the many food courts in Taiping, this eatery has mostly stalls selling Chinese food. Locals often order the Chee Cheong Fun and Popiah. Pusat Penjaja is located behind the fire station, on Jalan Tupai. The prices range from RM3 onwards. It is opened daily from 9AM-11PM. From Cantonese, Aulong Heo Pia translates into “fragrant biscuit”. As per its name, it is a thick, doughy biscuit with a sweet, sticky filling. The outside holds roasted sesame seeds and flaky pieces of thin flour. Aulong Heo Pia is a family favourite amongst many locals and visitors alike, and many visitors often choose to visit the main Aulong Heo Pia bakeries in Taiping. One of these bakeries are located in a house lot, along Aulong Baru. These biscuits are homemade and visitors can buy freshly-made ones. Aulong Heo Pia sells for about RM3-5 for a packet. This steakhouse is famous for its scrumptious Western delicacies – featuring many recommended and family favourite dishes such as steak, stroganoff, and chicken chop. This steakhouse is designed with a very homely, coffee-house style design to make customers feel at ease. The restaurant is recognizable by the signboard outside, on which features a dragon. Naga in Malay translates to dragon, and Ria to happy/jolly; Nagaria Steakhouse means ‘Happy Dragon’. Visitors can find this restaurant along Jalan Pasar. After visiting Kuala Sepetang, visitors can visit this restaurant situated on a balcony overlooking the ocean. Also called Kedai Makanan Tepi Sungai, this eatery serves mostly Chinese-style dishes. Fishermen often haul their fresh catches to the restaurant, available for customers to pick and choose the style and the seafood dish they have in mind. Their most popular dishes include the Kam Heong Lala (clams), Kam Heong Crab, and steamed mantis prawns. Located along Jalan Sungai Manggis, it is very near to the Kuala Sepetang cruise rides and visitors can choose to visit the restaurant after a long day at the eco-park or river cruises. It is opened daily from 11AM to 9.30PM. This is a restaurant that is not only vegetarian-friendly, but also vegan-friendly. Serving mostly Chinese dishes, Jia Yi Dao features mock ‘meat’ dishes such as vegetarian ‘lamb’ curry and steamed ‘fish’ (made of flour and spices). Their recommended dish is the stir-fry tofu, a classic that is enjoyed by many customers and families who visit the restaurant. A lunch buffet is available from 10.30-2PM, including a salad bar and a multitude of available dishes. The restaurant is situated on Jalan Lee Siew Aun, and is opened on Mondays 10.30-3PM and on Wednesday-Sundays 5.30-10PM. The interior of this restaurant is particularly eye-catching, as it is decorated in a very antique, Oriental Chinese style. The restaurant serves mostly Chinese-style seafood dishes, but is Halal for Muslim customers as well. Recommended dishes include its Chilli Ikan Bakar, Tom Yam Seafood, Mo Gui Fish, Bread in Curry Prawn, and the specialty of the restaurant – BBQ Stingray. The food served is relatively inexpensive, priced at about RM7 onwards. Mr BBQ is opened on Monday-Sundays 11-3PM (lunch hour) and 5-11PM (dinner). Visitors can find it on Jalan Maharajalela. Flemington Hotel is a newly constructed modern-style hotel, equipped with sprawling glass windows and comfortable restaurants inside. On top of the 5-floor hotel sits a Skybar, featuring panoramic views of the Taiping Lake Gardens. The bar features a pool, and is equipped with radio, LCD TVs, and Wifi. Tourists often find Flemington Hotel and its Skybar convenient due to its amenities, as well as its location. Visitors can access the Lake Gardens by a short walk. Located along Jalan Samanea Saman, the Skybar is opened from 8AM until 1AM daily. Deriving from a Dutch word, “Oosten” means East and the bar is decorated as such – the interior filled with Eastern civilization-themed decoration and wall hangings. The bar is popular amongst sports fanatics as well as people looking for a relaxing evening after work. Featuring multiple LCD TVs for sports fans, the bar serves beer, spirits, wines, and cocktails. Oosten Sports Bar also has a food menu, and the bar recommends its Ooze Meatballs and its East Wings. It is most popular during happy hour – 4-9PM daily. You can find Oosten on Jalan Istana Larut, near Tesco Taiping. This quaint café gives off a vibe of homeliness and comfort – shown by its homemade desserts. Espresso Yourself serves sweet treats such as coffee, cakes, pastries, and desserts. One of its most popular snacks include the cream cheese and smoked salmon bagel, toasted in its special pizza oven imported from Portugal. Visitors can find this café along Jalan Pasar. This open air coffee-shop style eatery features many stalls selling mostly Chinese and non-Halal food. It is frequented during dinner time by many locals. Some of the recommended dishes include the Char Kuay Teow, and the HK Wan Tan Mee. Food here is relatively inexpensive at RM5 onwards, and Prima Restoran is opened on Monday-Sundays from 6.30PM-midnight. Situated in an area called the Circus Grounds (aptly named for the travelling circus that settles here from time to time), visitors can find the many stores located next to a small field. It serves Halal foods as well as non-Halal, and serves a variety of local Malay, Chinese, and Indian cuisines. The recommended dish here comes from a stall labelled C37 – selling local favourite Chee Cheong Fun. Prices are cheap, ranging from RM3 upwards. The Gate Café offers a large variety of both Western and local delicacies. Some of the Western dishes include black pepper chicken chop, spaghetti carbonara, butter chicken rice, and grilled chicken with BBQ sauce. Dishes served are Halal. Prices are slightly higher than the restaurants on this list, ranging from RM8 onwards. Visitors can find this restaurant on Jalan Kampung Maharajalela. A popular Chinese restaurant, this large venue often hosts parties and weddings within its vicinity. Located opposite New Champagne Hotel, it provides eight course dinners for events. Some of its dishes include shark fin soup, red snapper fish, and yam basket with assorted vegetables. Other popular dishes include Chinese-style seafood, including clams. Dishes are significantly more expensive, however portions are large and family-friendly. Food here is non-Halal. Visitors can find this restaurant along Jalan Dato Chan Swee Ho, and Soon Lee is opened daily from 11AM-3PM, and 5.30PM-10.30PM. This roadside stall in Kuala Sepetang serves delicious bowls of Mee Udang, priced at approximately RM9 for for Mee Udang biasa. Customers can opt to try the traditional Mee Udang – noodles in soup with prawns, or fried noodles/rice with squid, crab, or prawn (or all three!). The portion is very generous and the broth rich with flavour. Next to Mak Jah is a kuih stall selling local desserts from RM3 upwards. Some of the recommended delicacies are the cucur udang (with peanut dipping sauce) and deep fried tofu. This open-air eatery serves Halal seafood dishes in the form of steamboat. Serving mostly Malay-style dishes, this restaurant is extremely popular for families due to its friendly environment. The menu does include Western-style dishes such as sirloin steak and lamb chop. Dishes are a lot pricier than other restaurants on the list, ranging from RM15 upwards. Visit Malaysia’s oldest coffee mill, Aun Tong Coffee Mill, that has been operating since 1933. You will not only be able to watch but also learn about how Malaysia’s authentic Kopi ‘o’ is processed - roasted in ovens fuelled by recycled wood, mangrove logs and so on. Be sure to pick up their Kopi ‘o’ powder on your way out to enjoy some of the coffee back home. You can even get Durian flavoured white coffee! Built in 1926 for Sultan Iskandar Shah, this served as the official royal residence from 1931 to 1933 and now serves as the grounds for the Royal Museum of Perak. When in Taiping, make the most of your holiday and be sure to experience all 50 of these activities we’ve listed for you! If you know of anything else to add onto this list, feel free to comment in the box below.